Hareidi journalist claims Israel gets better protected by them learning & praying. Can they do both? While secular politicians tend to accuse religious Israelis of draft-dodging, a new study shows that over 20% of secular Jews avoid service. The percentage of secular men who escaped the draft for health-related reasons had dropped slightly in 2010, with only 5.5% stating they could not serve for medical or psychological reasons, compared to 6.3% in 2009. IDF officials credited more stringent rules regarding exemptions for the drop. Other reasons for failure to enlist included difficulty adjusting, a criminal background, and moving to live outside Israel. In total, 66% of men and women from secular homes who were drafted in 2010 enlisted in the IDF, while one third said they were unable to serve. Religious Enlistment: In the religious-Zionist community, motivation for military service is high among men. Religious Zionists are disproportionately likely to become officers. Jewish-American, Lucas Siminofsky, discussed with JewTube.Info his decision to enlist and serve in the I.D.F. infantry as a "Lone Soldier"(Hayal Boded) when he was 18-years old in 2010. The Jewish Telegraphic Agency reported in April 2012 that there were an "estimated 5,000" Lone Soldiers enlisted. About 40% of them serve in combat units. Mr. Siminofsky discusses the irony of secular, diaspora Jews (like himself) enlisting to protect and defend the Holy Land from irredentist Arab attackers, while hareidim (as well as many native, secular Israelis) who both live and benefit from the security which the military affords society, endeavor to avoid national service. At last week's AIPAC 2014 Policy Conference in Washington, JewTube asked Hareidi-Israeli news journalist, Meir Berger ("Hamevaser") to clarify the Hareidi position on Israeli yeshiva students avoiding participating in national military service. 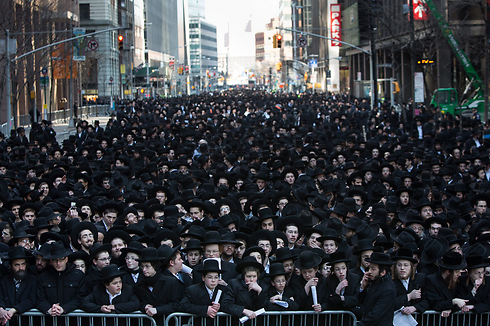 On Sunday 9 March, thousands of ultra-Orthodox Jews filled the streets of lower Manhattan on Sunday to protest Israel's proposal to draft haredi citizens into its army. A week ago, hundreds of thousands of ultra-Orthodox Jews rallied in the streets of Jerusalem, blocking roads and paralyzing the city in a massive show of force against plans to require them to serve in the Israeli military. The widespread opposition to the draft poses a challenge to the country, which is grappling with a cultural war over the place of the ultra-Orthodox in Israeli society. The issue of army service is at the core of that struggle. Since Israel's founding in 1948, the ultra-Orthodox, who make up about 8 percent of Israel's 8 million citizens, largely have been allowed to avoid military service, compulsory for most Jewish men, to pursue their religious studies. Older men often don't work and collect welfare stipends while continuing to study full time. The ultra-Orthodox insist their young men serve the nation through prayer and study, thus preserving Jewish learning and heritage, and by maintaining a pious way of life that has kept Jewish culture alive through centuries of persecution. But the exemption has enraged secular Israelis who say the ultra-Orthodox are not doing their fair-share. The issue featured prominently in last year's election, which led to the establishment of a center-right government that has been pushing for reforms that will require ultra-Orthodox to serve in the army. The Knesset is expected to vote on the conscription bill later this month. The bill, which would not go fully into effect until 2017, would impose criminal sanctions on ultra-Orthodox draft-dodgers. However, yeshiva students would have the right to defer service until age 26. (With reporting from the A.P. in YNet News).